The words ‘here’ and ‘there’ are spatial deictic references that are familiar to all English speakers. ‘Here’ means ‘near the speaker’. ‘There’ means ‘not near the speaker’. Two words related to ‘here’ and ‘there’ are ‘this’ and ‘that’ which work much like ‘the’ but refer to things that are ‘near the speaker’ or ‘not near the speaker’. So, in English, all spatial deictic references are relative to the speaker. 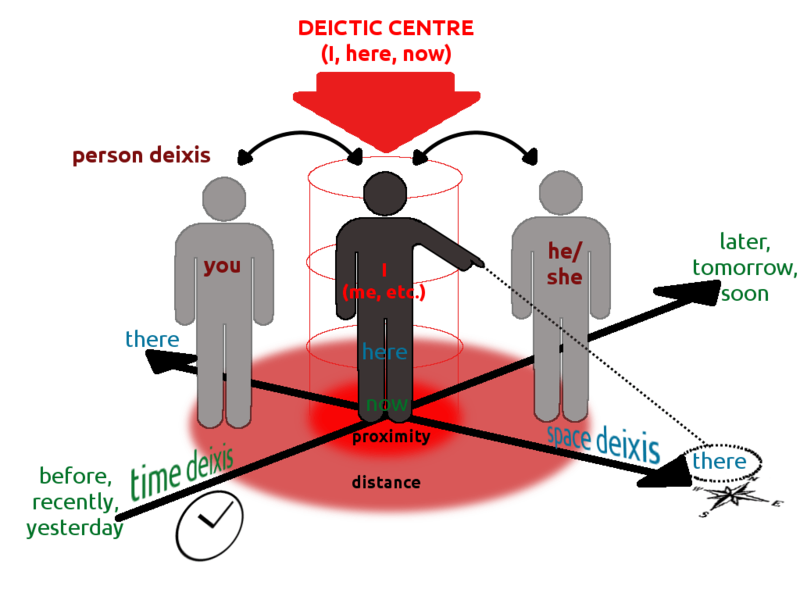 Here is an illustration of spatial deixis taken from the Wikipedia article on deixis. 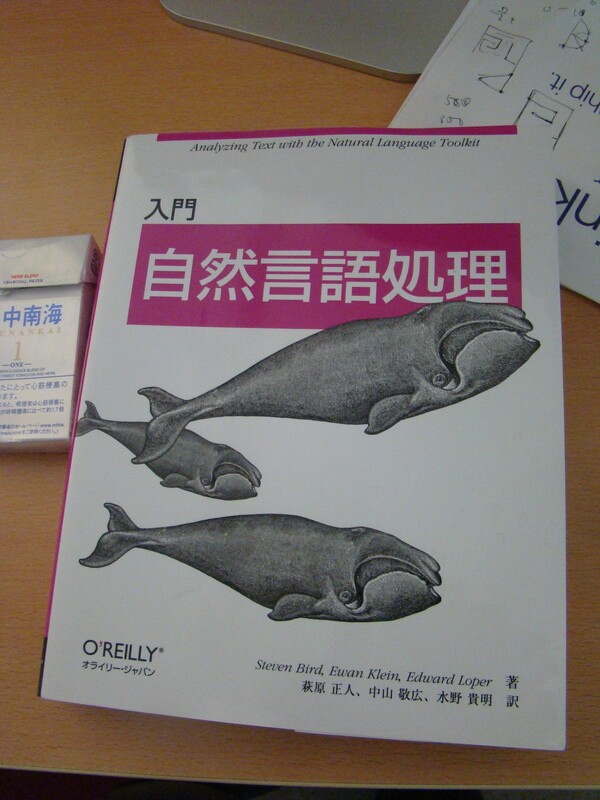 But there are languages in which there are more than two spatial deictic references. Japanese, Korean and Tamil have three each. In Japanese, they are koko, soko and asoko. In Korean, they are yogi, kugi and chogi. (Here is a very nice lesson on deixis in Korean http://www.talktomeinkorean.com/lessons/l1l7). In Tamil, they are inge, unge and ange. The reason for the additional deictic reference is that in these languages, distances are perceived not just with respect to the speaker, but also with respect to the listener. So, in Japanese, Korean and Tamil respectively, koko, yogi and inge mean ‘near the speaker’. Then, soko, kugi and unge mean ‘near the listener’. Finally, asoko, chogi and ange mean ‘far from both the speaker and the listener’. The “near the listener” deixis seems like a rather useless feature to have in a language (it is disappearing from modern Tamil). In the modern world, when you talk to someone face to face (not on the phone), you are usually standing just a few feet from them. So, anything “near the speaker” is also “near the listener”. One of those spatial references is therefore redundant. But then, if one of the spatial references was so useless, why did it appear in Korean and Japanese in addition to Tamil? Perhaps it has something to do with the fact that Korea and South India are peninsulas, and Japan is an island. All three countries have long coastlines. So, some ancestors of the inhabitants of Korea, Japan and South India might have lived off of deep-water fishing. On the ocean there is an immediate use for the “near the listener” deictic. Imagine a fleet of boats spread out on the ocean looking for fish to spear or net. The boatmen would have no features to use to communicate directions. The only features they’d have had to identify positions would have been their own boats. Boat 1: Are there any fish near you (the listener)? Boat 2: No, there are no fish near me (the speaker). Are there any fish near you (the listener)? Boat 1: No, there are no fish near me (the speaker). We should look for fish away from both of us (pointing)? In such conversations, all three deictics would have been used. The sentence “Are there any fish near you (the listener)?” would have used the word soko (in Japanese), kugi (in Korean) and unge (in Tamil). The sentence “No, there are no fish near me (the speaker)” would have used the word koko (in Japanese), yogi (in Korean) and inge (in Tamil). The sentence “We should look for fish away from both of us (pointing)” would have used the word asoko (in Japanese), chogi (in Korean) and ange (in Tamil). I am just guessing at all this, of course. Part of the fun of working in linguistics is that you can extrapolate from tenuous linguistic clues, and indulge in wild flights of fantasy. But what I am proposing is not entirely unimaginable. In 2011, in a small cave (called the Jerimalai cave) in East Timor, archaeologists found bones from 2843 individual fish, some of which were caught 42000 years ago. 50% of the bones were those of deep-water tuna fish. The finds also included fish hooks dating from between 23000 and 16000 years ago. My father recently pointed me to the research work of Dr. Susumu Ohno, a Japanese linguist who studied ancient Japanese as well as ancient Tamil (a language spoken in South India). Dr. Ohno (in a paper titled “The Genealogy of the Japanese Language”) made a number of interesting observations about phonological similarities and the existence of cognates (similar-sounding words) in the some forms of both languages. 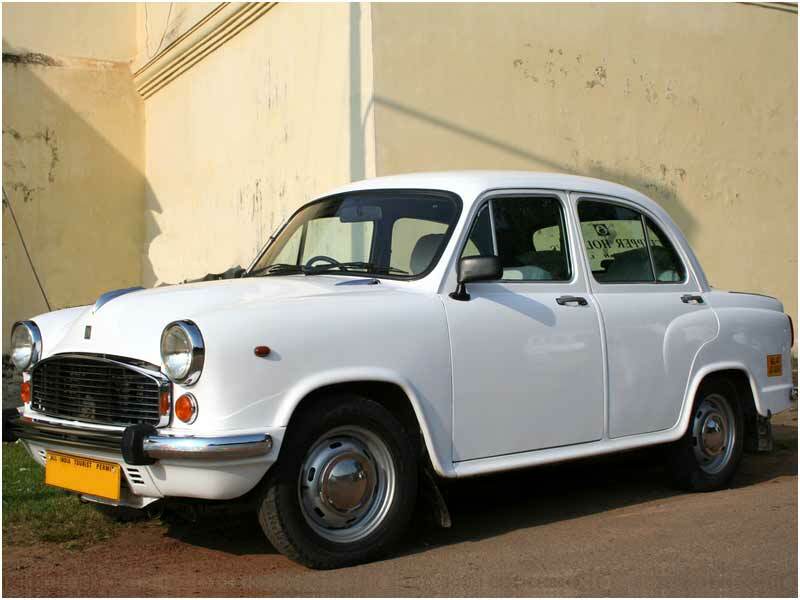 For example, he noted that the in some dialects of Japanese, the words for “father”, “mother”, “elder brother” and “elder sister” are similar to the words used in Tamil. In some Honshu and Ryukyu dialects of Japanese, the words for father, mother, elder brother and elder sister are “accha”, “aaya”, “annyaa” and “anne”. Ohno argues that these words resemble the words “acchan”, “aaya”, “anna” and “annai” in Tamil. I found that his observations supported some arguments that I had made in a blog entry in 2010 (I’d attempted to draw a 3-way comparison between Japanese, Tamil and Australian aboriginal languages). He proposes a theory that in early Japanese, there were no e and o sounds – that these sounds were replacements for ai or ia and ua. Though I don’t have a reference, I am told that T. P. Meenakshi Sundaram made an almost identical assertion in the case of Tamil. You also see some evidence of such a transformation in the Tulu word “yan-ku” (to me). The corresponding word in Tamil is “en-akku”. The correspondence makes you think that sometime in the past, they used to say “yan-akku” in Tamil instead of “en-akku”. You see a similar correspondence in Kannada. The Kannada word for why can be written and pronounced as “yaake” or as “eke”. So “ia” seems to be replaceable with “e” there. Similarly in Tamil, the word “evan” (who) can also be pronounced (colloquially) as “yaveng”. So, if both ancient Tamil and Japanese used just a, i and u sounds, their phonetics begins to resemble that of Australian languages like Dyirbal. Unfortunately, I don’t know Dyirbal or any Australian language. So, I can’t check if these rules apply to them as well. I can’t wait to get hold of a linguistic analysis of Dyirbal by an Indian or Japanese linguist. This blog post is about a story titled “Melanctha” by Gertrude Stein, a novelist who lived at about the same time as Renoir and Picasso. Picasso painted a portrait of the author that this blog post is about. Picasso painted a portrait of the author in eighty sittings that spanned a year, and finally ended by painting out her face and replacing it with a mask. I recently came across her writings in a book by the name of “Three Lives”. The description of the writings in the introduction was very intriguing, so I picked up the book. In the introduction, I read that Gertrude had had a very high opinion of the importance of her writing and had once said “think of the Bible and Homer, think of Shakespeare, and think of me”. In the introduction, I read that she considered the second story in “Three Lives” about a girl called “Melanctha” to be “the first definitive step away from the nineteenth century and into the twentieth century in literature”. The story did not disappoint. The language in “Melanctha” was very different from anything I’ve ever read, and it produced a very pleasant sensation. The language was very different, and it’s about the language that I want to write. One interesting thing about the language is that in some parts phrase patterns appear in pairs and with a rhythm. In some parts, the repetition gives rise to sentences like. I found an essay on Stein’s work online that said that Stein had tried to write memory-less literature, where the literature kept itself always in the present by not relying on the reader’s memories of past sentences. But it seemed to me that there was a sort of similarity with impressionist painting if you considered the granularity of language used in rendering the story. What Gertrude’s writing had in common with impressionist paintings, it seemed to me, was a form of broad, rough brush-strokes. So, it seemed to me that the phrases that were often repeated in quick succession, fused within themselves to became separate units of expression, and therefore the smallest units of expression that Gertrude’s stories were built of were not single words, but phrases made of many words, making the language richer and more beautiful. There was also a certain musicality in the prose. There was a certain way for certain phrases to be repeated time and again, like a musical theme, for example, the line “what you mean by what you were saying” which, with its variants appears time and time again in the story. Finally, I found it hilarious to read in the story a passage that was very similar to things that Ramana Maharishi and Osho had said about “thinking” that I had quoted in an older blog post in November https://aiaioo.wordpress.com/2012/11/22/contradictions-in-some-thoughts-on-thinking/. I had quoted the above and commented that those who wrote that must have thought a lot about thinking. In the story “Melanctha” there was a meme that was similar to the above lines that I had quoted. “Don’t you ever stop with your thinking long enough ever to have any feeling Jeff Campbell,” said Melanctha a little sadly.